This hydraulic fracturing well pad is located on a state forest in Eastern Pennsylvania. In the four months since the Delaware River Basin Commission issued proposed regulations covering hydraulic fracturing, thousands of people have come forward to speak at public hearings and in written comments about the importance of protecting natural resources in this critical watershed. Among the 8,687 written submissions the DRBC received was a letter of support from 42 national, regional, and local sportsmen’s organizations, including Trout Unlimited and its councils and chapters in the Delaware River Basin, Fly Fishers International, state chapters of Backcountry Hunters and Anglers, the Quality Deer Management Association, and the New Jersey Outdoor Alliance. Nationally, TU advocates for responsible energy development that avoids, minimizes, and mitigates impacts to our natural resources. 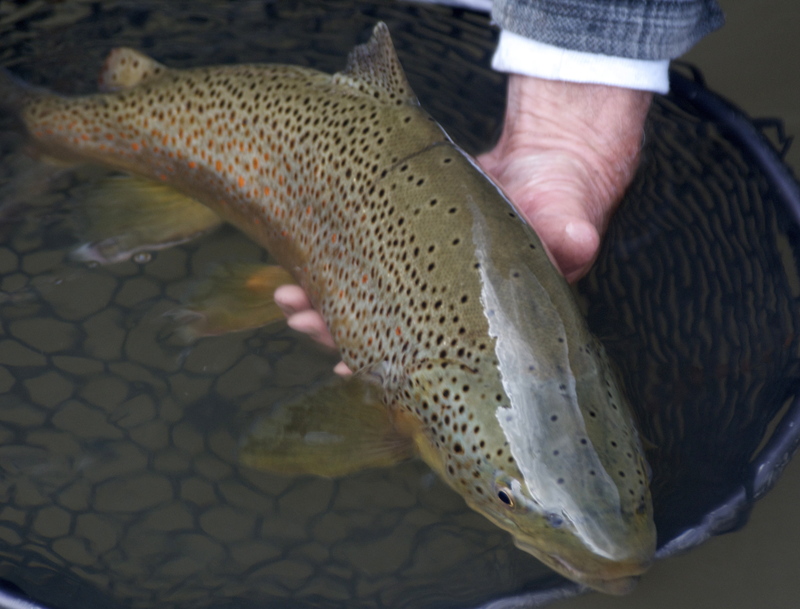 Not long ago, we identified the Upper Delaware, with its thriving wild trout fishery, as one of “10 Special Places” in the central Appalachians deserving special protection in the face of natural gas development. The DRBC’s proposed regulations would prohibit fracking in the Basin, and regulate related activity, such as water withdrawals for use in hydraulic fracturing elsewhere, and the import of fracking wastewater for treatment in the Delaware watershed. TU and our partners in the sportsmen’s community agree that prohibition in this watershed is justified, given the DRBC’s long study of the issue and given the Basin’s ecological and economic importance. At the same time, the regulations allow the possibility of millions of gallons of water withdrawals, but do not address the conditions that would be required to ensure that this is done safely. The regulations do not, for example, address pass-by monitoring to protect streams’ ecological flow requirements. And while any facility proposing to treat fracking wastewater would need to meet stringent requirements and treat “pollutants of concern” to background levels, the regulations do not account for all of the 1,600 chemicals that can be found in produced water and fracking fluids. With the public comment period closed, the DRBC is now reviewing the public comments and determining what revisions may be required. No timetable for action has been announced. David Kinney is Eastern Policy Director for Trout Unlimited. Sports enthusiest write their local officials and those in Washington however it seems as if either the officials can’t read or just not interested. To quote feedback from another movement by a reprsentative from Secretary Zinkes office “well this isn’t a popularity contest”. Just how can you fight that mentality?? I support these regulations so much! Myself being from Upstate N.Y. these rivers need to be protected, not only the Delaware but all the trout water in N.Y.S. We as trout fishermen, know that we don`t have the fisheries like they have out west,so we have to protect the few we still have. I can`t believe that I have to travel 1.5 to 2.0 hrs. to get to a decent trout stream, and I live upstate! I`m planning a trip to fish both the West & East branches of the Delaware this summer becouse of it`s reputation as being one of N.Y`s last great tail waters, and I want to fish it. Let`s help it keep it`s legendary reputation and rally against any type of misuse of this great fishery. Has no one noticed that the tag line "Log in or register to post comments" is placed so that it covers part of the comment?? ?